A spartan stump of the southern steeple remains. 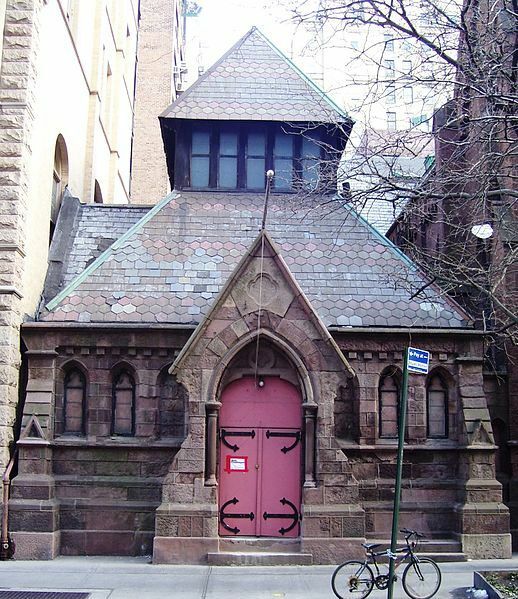 While the residential neighborhoods of New York were still inching northward well below 14th Street, a little wooden church was erected in 1836 at the corner of 4th Avenue and 30th Street. Here the Calvary Protestant Episcopal Church established itself in the rolling, semi-rural area. The congregation moved in 1844 to a similar wooden building at 4th Avenue and 22nd Street. 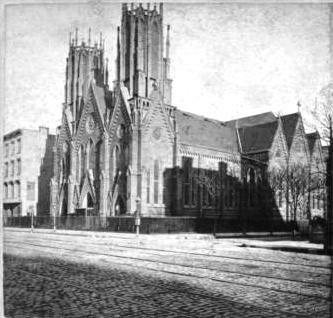 The new church was a temporary one and two years later the cornerstone was laid for a Gothic brownstone structure on the corner of 4th Avenue and 21st Street. One block to the east Samuel B. Ruggles was finishing his development a two-acre plot of land that he called Gramercy Park. The commission was an important one for fledgling architect James Renwick, Jr. Within a matter of a few years he would design the Smithsonian Institution’s Renwick Gallery, St. Patrick’s Cathedral and important civic buildings on Blackwell’s Island. An early print depicts the towers with tall spires. For Calvary the architect a sophisticated Gothic structure based on the French double-spired church design. Completed in 1848, its three entrance doors faced 4th Avenue (later to become Park Avenue South). Three sharp gables with Gothic trim held rose windows with brownstone tracery. Renwick’s abundant stained glass windows filled the sanctuary with light. Two intricate wooden towers – depicted in at least one print as having spires – rose from the 4th Avenue corners. Abutting the church to the north was a small theatre of delightful proportions and design. A multi-colored slate roof of various shaped tiles and its fairy-tale appearance resulted in its being called the Renwick Gem. As Gramercy Park and the Murray Hill areas developed with grand brownstone dwellings, the congregation that had once been essentially a country church became one of the most influential in the city. Chester A. Arthur, who would become the 21st President of the United States, married Ellen Lewis Herndon here on October 25, 1859 and a year later, as the Civil War was about to erupt, General George B. McClellan was married here on May 22. 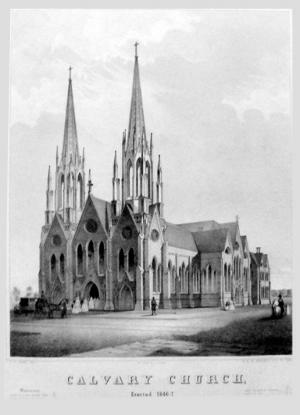 During the second half of the 19th Century the church would be the site of weddings like that of Alva and William Vanderbilt (reported as “the grandest wedding witnessed” in the city for years), and would be the place of worship for families like Astors and Vanderbilts. Eleanor Roosevelt was baptized here and when Edith Wharton wrote her masterful “The Age of Innocence,” she based the character of Dr. Ashmore on the Rev. Edward Washburn, rector from 1865 to 1881. In 1867 Renwick was called back to design the nine-story Calvary House behind the church. 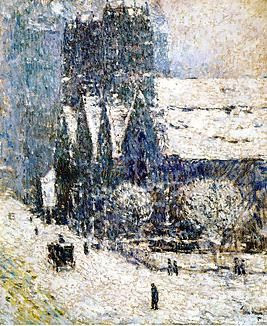 In 1893 American impressionist Childe Hassam painted "Calvary Church in the Snow"
A major scare occurred on January 5, 1896 when fire started in a defective flue in the basement. Burning under the south transept below the pew of the ex-Mayor Hewitt, the small fire caused about $100 in damages before being extinguished. Later in the day smoke was smelled in the sanctuary by Rev. Walter Hughson and Sexton Larson who dismissed it as lingering odors from the morning’s fire. Hughson left and within a few minutes, the sexton realized that, indeed, the church was on fire again – this time due to the overheating of the old furnace. Firemen smashed portions of the flooring and damaged the carpets but this fire, too, did not exceed $100 in damages. Flaming urns, the Victorian symbol of the eternal spirit, grace the cast iron fence. That same year a well-dressed “stout old lady” entered the church. She was noticed pacing up and down the aisles, but as she was seemingly in prayer, was left undisturbed. A few minutes later a shot rang out through the quiet sanctuary. The unknown woman had used a small pistol to commit suicide in a place of peace and beauty. One of the most notable services in Calvary Church was not the opulent weddings of society but the funeral for Rebecca Salome Foster – known city-wide as the “Tombs Angel.” In the days when the city’s foreboding Egyptian Revival prison downtown was known as “The Tombs,” Mrs. Foster spent relentless hours in attempts to reform women and men charged with various crimes ranging from murder to petty larceny. The church was crowded with dignitaries, society figures and judges; as well as children from the slums and shabbily-dressed women and gang members. “Apple Mary,” well-known to police throughout the city was there as was Marie Barberi who had been charged with the murder of her cheating lover. Rebecca Foster had saved her from the gallows. Alongside these people were Elbridge T. Gerry, Justice George L. Ingraham, District Attorney Asa Bird Gardiner and a score of other judges and attorneys. Hundreds stood in the aisles and at the back of the crowded church. Early in the 20th Century the deteriorating wooden towers were removed, leaving on the side corner an plain, odd octagonal stump. Although in 1897 The Times deemed the congregation no longer “ultra-fashionable,” the Gramercy Park neighborhood never declined and Renwick’s striking Calvary Church is still lovingly maintained. Today the congregation remains a vibrant one and the adjoining Calvary House is rented out as office space.